posiebalm conditions & hydrates with mango butter and sodium hyaluronate. This kiss of sheer color gives you the prettiest lips. 3.0 g Net wt. 0.10 oz. Delight with a petal-soft pout. Blow a kiss with posiebalm & watch the love bloom. This sweet hydrating balm keeps spring in the air all year long. Got a date? Take this pop of pink along and ooh la la...you’ll be locking lips before dessert. Glide on bare lips or over your favorite tint. Muah! Sister sister! Wear posietint & posiebalm just-picked perfection. Love this lip balm tint, smells amazing, so hydrating, gives a lovely Suttle pinky tint, buildable I adore it, need to get some more, always in my bag, day to day product, PosieBalm You Got It Spot On!! I love texture, and how it look on lips. Really great product that moisturises my lips and is easy to apply! Very pretty pink colour would defo recommend ??? A new fav for me! I spent half my points from IPSY to purchase this product. Love, Love it! 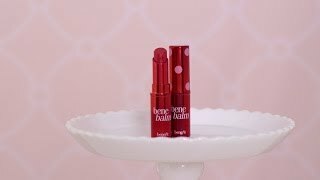 I like how it has a subtle sheer pink tint that makes my lips look kissable, love the smell, love the texture and it lasts! Really wish my sample was bigger....sample size was small and for someone loving this of course I want more! Would definitely purchase! Love everything about this balm. I can't get enough of posiebalm. It is moisturising, a gorgeous light colour that is buildable and I love the rosie smell. I wish there was a benefit perfume that smelled the same. I don't find it too strong like other users. Before purchasing I looked at the reviews and everyone was complaining about the rose scent, I purshased it anyway and when I recieved it the smell was a little strong but when you start to use it the smell wears down a lot. The colour is perfect it's so natural and it doesn't have that annoying glossy-ness to it. I love how it is presented as well and feels very sturdy and good quality. It's feels so must moisturising and soft, I think this should be an essential for everyone. I LOVE POSIEBALM! It is very sheer to start with, but can be built up. It is kinda more like how Benetint is in that way than Posietint. Posietint has an opaque nature to it (same with ChaCha), but the balms of these versions are much more sheer. Makes it easy to combine them and switch it up for even more options. This one for me just gives me a bit of colour with one coat. Great for fresher looks. With Posietint it would be more of a pop of colour. I saw some people really complained about the scent - it does smell like roses, but personally I didn't have a problem with it at all. I smelled it in the tube, and once on the scent didn't really linger/I didn't notice at all. If it is a concern of yours, I'd try and get to a counter before buying it so you can test it and whatnot. take it everywhere with me! I Love this, worth every cent. moisturizing with a hint of color. Perfection. Way too strongly scented of roses! Can't wear it! I was looking forward to this product's release and wanted so badly to like it. I was thrilled to receive it in a popular subscription box. Unfortunately, Posie Balm is so strongly scented of roses, I can't wear it. Usually I can at least wear something as a blush, but the fragrance of Posie Balm is so strong, there's just no way I can get it anywhere near my face--let alone wear it as a lip balm, where it would be under my nose. It's too bad, because the color looked lovely and I love the packaging. This product is very moisturizing and has a slight tint to it. I LOVE the packaging but am really off put by the smell. Is this product gluten free ? Just wondering if this lip product is GF as i do not use any lip items that are not.